The present invention relates to a non-unit dose laundry detergent composition suitable for use in a single-compartment container comprising: (a) detersive surfactant; (b) from 0wt% to 10wt% water; (c) bleach; (d) optionally, from 0wt% to 5wt% citric acid; and (e) optionally, from 0wt% to 5wt% fatty acid, wherein the composition comprises at least 1wt% solid particles suspended within a continuous liquid phase, wherein the suspended solid particles comprise bleach, wherein the weight average particle size of the suspended solid bleach particles is at least 1 micrometer, wherein at least 95wt% of the suspended solid bleach particle sizes have a size in the range of from 0.1 micrometers to 500 micrometers, wherein the density of the suspended solid bleach particles is less than 500g/l, and wherein the dynamic viscosity of the continuous liquid phase is in the range of from 100mPas to 500mPas. The present invention relates to a laundry detergent composition. The laundry detergent composition comprises a continuous liquid phase that has suspended bleach particles therein. Such compositions exhibit good bleach storage stability and performance, and good cold water cleaning performance. The compositions are non-unit dose, and are suitable for use in a single - compartment container. Liquid laundry detergent formulators have for many years attempted to incorporate bleach into the formulation. For example, attempts have been made to formulate liquid detergent compositions for use in dual compartment containers, such as dual compartment bottles, which allow the detergent formulator to separate the bleach ingredients from the bleach sensitive ingredients. Other attempts have been to suspend solid bleach ingredients in a liquid and to then enclose the liquid in a film so as to form a unit dose pouch. However, there is still an unmet consumer need for a bleach-containing liquid laundry product that is not a dual compartment bottle, and is not a unit dose form, but instead allows the consumer to vary and choose the dose according to their needs and desires. Such products are very difficult to formulate and achieve good storage stability and a good consistent dosing profile. Unit dose compositions ensure that good consistent dosing is achieved by enclosing the liquid composition in a film to form a pouch. Such unit dose product forms do not have any significant problems if the suspended solid bleach particles settle out of the continuous liquid phase as they are still enclosed by the film, and consistent dosing profile is still maintained. Dual compartment bottle approaches suffer from poor accurate dosing, as the execution relies on ensuring consistent dosing occurs from both containers, and this approach also involve expensive, complicated and often bulky packaging, which the consumers do not particularly desire. The inventors have overcome these problems by providing a bleach-containing liquid detergent composition that is not in unit-dose form, and is suitable for use in single compartment containers, such as the conventional single compartment bottles currently being used in the market, thus negating the need for expensive and elaborate developments in dual compartment packaging to enable the use of bleach-containing liquid laundry detergent products. The inventors have found that suspending bleach in a continuous liquid phase and by carefully controlling the particle size and distribution, and density of the suspended solid bleach particles, and by carefully controlling the rheology and water content of the continuous liquid phase, a stable liquid laundry detergent product is obtained. The composition of the present invention comprises suspended solid bleach particles that readily remain suspended, even during prolonged storage and do not readily settle out of the continuous liquid phase, thus providing an excellent consistent dosing profile. The composition of the present invention does not need to be enclosed by a film to form a unit dose pouch to catch any settling out suspended solid bleach particles so as to ensure a good consistent dosing profile. In addition, the composition of the present invention does not need to be separated into a dual compartment packaging to ensure good storage stability and bleaching performance. The suspended solid bleach particles remain stable, even after prolonged storage, provide good bleaching performance and are compatible with the remainder of the detergent composition and the continuous liquid phase, due to the careful control over the physical properties of the suspended solid bleach particles and the rheology and water content of the continuous liquid phase. In addition, the composition is suitable for use in compacted form, and is compatible with, and its performance is significantly improved with no detriment to its stability profile, by the incorporation of into the composition of: bleach catalysts, preferably an oxaziridinium-based bleach catalyst; alkanolammonium counter-ions; high levels of enzymes, such as first wash lipases; polyamines; and any mixtures thereof; or by the concentration of the liquid detersive ingredients by reducing the levels of, or even removing: water, citric acid, fatty acid, solvent and/or builder. The present invention relates to a composition as defined by claim 1. Laundry detergent composition. The laundry detergent composition is a non-unit dose laundry detergent composition that is suitable for use in a single- compartment container. The composition comprises a continuous liquid phase, most preferably a single continuous liquid phase, that comprises a discontinuous particulate solid phase suspended in the continuous liquid phase. The composition typically does not comprise two or more continuous liquid phases, is not part of a multi-compartment pouch, and is not dispensed from a multi-compartment container. The composition is in non-unit dose form. The composition is a fully finished laundry detergent composition. The composition is not just a component of a laundry detergent composition that can be incorporated into a laundry detergent composition: it is a fully finished laundry detergent composition. That said, it is within the scope of the present invention for an additional rinse additive composition (e.g. fabric conditioner or enhancer), or a main wash additive composition (e.g. bleach additive) to also be used in combination with the liquid laundry detergent composition during the method of the present invention. Although, it may be preferred for no bleach additive composition is used in combination with the laundry detergent composition during the method of the present invention. The laundry detergent composition comprises: (a) detersive surfactant; (b) from 0wt% to 10wt% water; (c) bleach; (d) optionally, from 0wt% to 5wt% citric acid; and (e) optionally, from 0wt% to 5wt% fatty acid, wherein the composition comprises at least lwt% solid particles suspended within a continuous liquid phase, wherein the suspended solid particles comprise bleach, wherein the weight average particle size of the suspended solid bleach particles is at least 1 micrometer, wherein at least 95wt% of the suspended solid bleach particle sizes have a size in the range of from 0.1 micrometers to 500 micrometers, wherein the density of the suspended solid bleach particles is less than 500g/l, and wherein the dynamic viscosity of the continuous liquid phase is in the range of from lOOmPas to 500mPas. The continuous liquid phase and suspended solid particle phase are described in more detail below. Preferably, the ratio of: (i) the density of the suspended solid bleach particles to (ii) the density of the continuous liquid phase is in the range of from 0.5:1 to 2:1, preferably from 0.6:1, or from 0.7:1, or from 0.8:1, or even from 0.9:1, and preferably to 1.9:1, or to 1.8:1, or to 1.7:1, or to 1.6:1, or to 1.5:1, or to 1.4:1, or to 1.3:1, or to 1.2: 1, or even to 1.1:1. Suspended solid particles. The composition comprises at least lwt%, preferably at least 2wt%, or at least 3wt%, or at least 4wt%, or at least 5wt%, or at least 6wt%, or at least 8wt%, or at least 10wt%, or even at least 12w% solid particles suspended within a continuous liquid phase. The suspended solid particles comprise bleach. The weight average particle size of the suspended solid bleach particles is at least 1 micrometer, preferably at least 2 micrometers, or at least 5 micrometers, or even at least 10 micrometers, and preferably is in the range of from 1 micrometer to 500 micrometers, preferably from 1 micrometer to 200 micrometers, or from 1 micrometer to 100 micrometers, or even from 1 micrometer to 50 micrometers. The density of the suspended solid bleach particles is less than 500g/l, preferably in the range of from lOOg/1 to 500g/l, or even from 200g/l to 500g/l. The suspended solid bleach particles may comprise: (i) separate particles comprising source of available oxygen; and (ii) separate particles comprising bleach catalyst. That is to say, the source of available oxygen and bleach catalyst are in separate, physically distinct particles. It may be preferred, however, for the suspended solid bleach particles to comprise bleach activator and a source of hydrogen peroxide. Continuous liquid phase. The continuous liquid phase can be any suitable liquid form, such as a viscous liquid or even a gel. Preferably the continuous liquid phase is in the form of a gel, Typically, the continuous liquid phase is pourable from the single-compartment container in which it is typically contained prior to dispensing into the wash bath. The dynamic viscosity of the continuous liquid phase is typically at least lOmPas, and preferably is in the range of from lOOmPas to 1, 500mPas, preferably to 1,000 mPas, or to 750mPas, or to 500mPas, when typically measured at a shear rate of 20s"1 and a temperature of 20°C. It may be preferred for the continuous liquid phase to comprise detersive surfactant, optionally polymer and optionally enzyme. Detersive surfactant. The detersive surfactant typically comprises anionic detersive surfactant and non-ionic surfactant, wherein preferably the weight ratio of anionic detersive surfactant to non-ionic detersive surfactant is greater than 1:1, preferably greater than 1.5 : 1 , or even greater than 2:1, or even greater than 2.5:1, or greater than 3:1. Preferably, the surfactant comprises alkyl benzene sulphonate and one or more detersive co- surfactants. 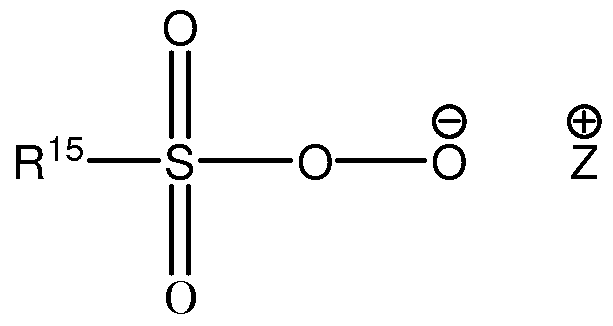 The surfactant preferably comprises C10-C13 alkyl benzene sulphonate and one or more co- surfactants. The co-surfactants preferably are selected from the group consisting of Ci2- Ci8 alkyl ethoxylated alcohols, preferably having an average degree of ethoxylation of from 1 to 7; C12-C18 alkyl ethoxylated sulphates, preferably having an average degree of ethoxylation of from 1 to 5 ; and mixtures thereof. However, other surfactant systems may be suitable for use in the present invention. Preferred anionic detersive surfactants include: linear or branched, substituted or unsubstituted alkyl benzene sulphonate detersive surfactants, preferably linear C$-Ci$ alkyl benzene sulphonate detersive surfactants; linear or branched, substituted or unsubstituted alkyl benzene sulphate detersive surfactants; linear or branched, substituted or unsubstituted alkyl sulphate detersive surfactants, including linear Cg-Cig alkyl sulphate detersive surfactants, C1-C3 alkyl branched C$-Ci$ alkyl sulphate detersive surfactants, linear or branched alkoxylated C$-Ci$ alkyl sulphate detersive surfactants and mixtures thereof; linear or branched, substituted or unsubstituted alkyl sulphonate detersive surfactants; and mixtures thereof. Preferred anionic detersive surfactants are selected from the group consisting of: linear or branched, substituted or unsubstituted, C12-18 alkyl sulphates; linear or branched, substituted or unsubstituted, Cio-13 alkylbenzene sulphonates, preferably linear Cio-13 alkylbenzene sulphonates; and mixtures thereof. Highly preferred are linear Cio-13 alkylbenzene sulphonates. Highly preferred are linear Cio-13 alkylbenzene sulphonates that are obtainable, preferably obtained, by sulphonating commercially available linear alkyl benzenes (LAB); suitable LAB include low 2- phenyl LAB, such as those supplied by Sasol under the tradename Isochem® or those supplied by Petresa under the tradename Petrelab®, other suitable LAB include high 2-phenyl LAB, such as those supplied by Sasol under the tradename Hyblene®. A suitable anionic detersive surfactant is alkyl benzene sulphonate that is obtained by DETAL catalyzed process, although other synthesis routes, such as HF, may also be suitable. Another suitable anionic detersive surfactant is alkyl ethoxy carboxylate. The anionic detersive surfactants are typically present in their salt form, typically being complexed with a suitable cation. Suitable counter-ions include Na+ and K+, substituted ammonium such as Ci-C6 alkanolammnonium preferably mono-ethanolamine (MEA) tri- ethanolamine (TEA), di-ethanolamine (DEA), and any mixtures thereof. (R)(Ri)(R2)(R3)N+ X wherein, R is a linear or branched, substituted or unsubstituted C6-i8 alkyl or alkenyl moiety, Ri and R2 are independently selected from methyl or ethyl moieties, R3 is a hydroxyl, hydroxymethyl or a hydroxyethyl moiety, X is an anion which provides charge neutrality, preferred anions include halides (such as chloride), sulphate and sulphonate. Preferred cationic detersive surfactants are mono-C6-i8 alkyl mono-hydroxyethyl di-methyl quaternary ammonium chlorides. Highly preferred cationic detersive surfactants are mono-Cs-io alkyl mono- hydroxyethyl di-methyl quaternary ammonium chloride, mono-Cio-12 alkyl mono-hydroxyethyl di-methyl quaternary ammonium chloride and mono-Cio alkyl mono-hydroxyethyl di-methyl quaternary ammonium chloride. Suitable non-ionic detersive surfactant can be selected from the group consisting of: C8- Ci8 alkyl ethoxylates, such as, NEODOL® non-ionic surfactants from Shell; C6-Ci2 alkyl phenol alkoxylates wherein the alkoxylate units are ethyleneoxy units, propyleneoxy units or a mixture thereof; Ci2-Ci8 alcohol and C6-Ci2 alkyl phenol condensates with ethylene oxide/propylene oxide block polymers such as Pluronic® from BASF; C14-C22 mid-chain branched alcohols, BA, as described in more detail in US 6,150,322; C14-C22 mid-chain branched alkyl alkoxylates, BAEx, wherein x = from 1 to 30, as described in more detail in US 6,153,577, US 6,020,303 and US 6,093,856; alky lpoly saccharides as described in more detail in US 4,565,647, specifically alkylpolyglycosides as described in more detail in US 4,483,780 and US 4,483,779; polyhydroxy fatty acid amides as described in more detail in US 5,332,528, WO 92/06162, WO 93/19146, WO 93/19038, and WO 94/09099; ether capped poly(oxyalkylated) alcohol surfactants as described in more detail in US 6,482,994 and WO 01/42408; and mixtures thereof. Suitable zwitterionic and/or amphoteric detersive surfactants include alkanolamine sulpho-betaines. It may be preferred for the composition to comprise branched anionic detersive surfactant and/or branched non-ionic detersive surfactant. Preferably, the branched anionic detersive surfactant and/or branched non-ionic detersive surfactant are derived from natural sources, preferably wherein the natural sources include bio-derived isoprenoids, most preferably farnescene. Bleach. The composition typically comprises bleach. Preferred bleach comprises a source of available oxygen in combination with a bleach activator and/or a bleach catalyst. percarbonate. The sodium percarbonate can be in the form of a coated percarbonate particle, the particle being a physically separate and discrete particle from the other particles of the laundry detergent composition, and especially from any bleach activator or the bleach ingredient. Alternatively, the percarbonate can be in the form of a co-particle that additionally comprises a bleach activator such as tetra-ethylene diamine (TAED) and the bleach ingredient. Highly preferred, when a co-particle form is used, a bleach activator at least partially, preferably completely, encloses the source of hydrogen peroxide. Another suitable source of available oxygen is a pre-formed peracid, such as those described in more detail below. R14— C- -O- -o Y wherein: R is selected from alkyl, aralkyl, cycloalkyl, aryl or heterocyclic groups; the R group can be linear or branched, substituted or unsubstituted; and Y is any suitable counter-ion that achieves electric charge neutrality, preferably Y is selected from hydrogen, sodium or potassium. Preferably, R14 is a linear or branched, substituted or unsubstituted C6-9 alkyl. Preferably, the peroxyacid or salt thereof is selected from peroxyhexanoic acid, peroxyheptanoic acid, peroxyoctanoic acid, peroxynonanoic acid, peroxydecanoic acid, any salt thereof, or any combination thereof. Preferably, the peroxyacid or salt thereof has a melting point in the range of from 30°C to 60°C. wherein: R is selected from alkyl, aralkyl, cycloalkyl, aryl or heterocyclic groups; the R group can be linear or branched, substituted or unsubstituted; and Z is any suitable counter-ion that achieves electric charge neutrality, preferably Z is selected from hydrogen, sodium or potassium. Preferably R15 is a linear or branched, substituted or unsubstituted C6-9 alkyl. The pre-formed peroxyacid or salt thereof may be in an encapsulated, preferably molecularly encapsulated, form. Typically, the pre-formed peroxyacid molecules are individually separated from each other by any suitable molecular encapsulation means. A highly preferred pre-formed peracid is phthalimido peroxy caproic acid. Phthalimido peroxycaproic acid is also known as: N, N-phthalimido peroxycaproic acid; 2H-Isoindole-2- hexaneperoxoic acid, l,3-dihydro-l,3-dioxo-; 5-(Phthalimido)percaproic acid; 6- (Phthalimidoperoxy)hexanoic acid; 6-Phthalimidohexaneperoxoic acid; Eureco; Eureco HC; Eureco HCL 11; Eureco HCL 17; Eureco LX; Eureco W; Phthalimidoperhexanoic acid; e- (Phthalimidoperoxy)hexanoic acid; and l,3-dihydro-l,3-dioxo-2H-Isoindole-2-hexaneperoxoic aci. The CAS number is 128275-31-0. Bleach activator. Preferably, the composition comprises a bleach activator. Suitable bleach activators are compounds which when used in conjunction with a hydrogen peroxide source leads to the in situ production of the peracid corresponding to the bleach activator. Various non limiting examples of bleach activators are disclosed in U.S. Patent 4,915,854, issued April 10, 1990 to Mao et al, and U.S. Patent 4,412,934. The nonanoyloxybenzene sulfonate (NOBS) and tetraacetylethylenediamine (TAED) activators are typical, and mixtures thereof can also be used. See also U.S. 4,634,551 for other typical bleaches and activators useful herein. Another suitable bleach activator is decanoyloxybenzenecarboxylic acid (DOBA). R1N(R5)C(0)R2C(0)L or R1C(0)N(R5)R2C(0)L wherein as used for these compounds R1 is an alkyl group containing from about 6 to about 12 carbon atoms, R2 is an alkylene containing from 1 to about 6 carbon atoms, R^ is H or alkyl, aryl, or alkaryl containing from about 1 to about 10 carbon atoms, and L is any suitable leaving group. A leaving group is any group that is displaced from the bleach activator as a consequence of the nucleophilic attack on the bleach activator by the hydroperoxide anion. A preferred leaving group is oxybenzenesulfonate. caprolactams, including benzoyl caprolactam, adsorbed into sodium perborate. Highly preferred bleach activators are nonanoyloxybenzene sulfonate (NOBS) and/or tetraacetylethylenediamine (TAED). Bleach catalyst. Preferably the composition comprises bleach catalyst. Preferred bleach catalysts include oxaziridinium-based bleach catalysts, transition metal bleach catalysts, bleaching enzymes, and any combination thereof. Enzymes. The composition prefereably comprises enzyme. Preferably, the composition comprises a relatively high level of enzymes. It may be preferred for the composition to comprise at least a ternary enzyme system selected from protease, amylase, lipase and/or cellulase. Lipase. Suitable lipases include those of bacterial or fungal origin. Chemically modified or protein engineered mutants are included. Examples of useful lipases include lipases from Humicola (synonym Thermomyces), e.g., from H. lanuginosa (T. lanuginosus) as described in EP 258 068 and EP 305 216 or from H. insolens as described in WO 96/13580, a Pseudomonas lipase, e.g., from P. alcaligenes or P. pseudoalcaligenes (EP 218 272), P. cepacia (EP 331 376), P. stutzeri (GB 1,372,034), P. fluorescens, Pseudomonas sp. strain SD 705 (WO 95/06720 and WO 96/27002), P. wisconsinensis (WO 96/12012), a Bacillus lipase, e.g., from B. subtilis (Dartois et al. (1993), Biochemica et Biophysica Acta, 1131, 253-360), B. stearothermophilus (JP 64/744992) or B. pumilus (WO 91/16422). Preferably, the composition comprises a variant of Thermomyces lanuginosa lipase having >90% identity with the wild type amino acid and comprising substitution(s) at T231 and/or N233, preferably T231R and/or N233R (herein: "first wash lipase"). (b) trypsin-type or chymotrypsin-type proteases, such as trypsin (e.g., of porcine or bovine origin), including the Fusarium protease described in WO 89/06270 and the chymotrypsin proteases derived from Cellumonas described in WO 05/052161 and WO 05/052146. (c) metalloproteases, including those derived from Bacillus amyloliquefaciens described in WO 07/044993. Preferred proteases include those derived from Bacillus gibsonii or Bacillus Lentus. WO 96/11262, WO 96/29397, WO 98/08940. Other examples are cellulase variants such as those described in WO 94/07998, EP 0 531 315, US 5,457,046, US 5,686,593, US 5,763,254, WO 95/24471, WO 98/12307 and PCT/DK98/00299. (Novozymes A S), CLAZINASE®, and PURADAX HA® (Genencor International Inc.), and KAC-500(B)® (Kao Corporation). In one aspect, the cellulase can include microbial-derived endoglucanases exhibiting endo-beta-l,4-glucanase activity (E.C. 3.2.1.4), including a bacterial polypeptide endogenous to a member of the genus Bacillus which has a sequence of at least 90%, 94%, 97% and even 99% identity to the amino acid sequence SEQ ID NO:2 in US 7,141,403) and mixtures thereof. Hydrolase family 45 having a molecular weight of from 17kDa to 30 kDa, for example the endoglucanases sold under the tradename Biotouch® NCD, DCC and DCL (AB Enzymes, Darmstadt, Germany). R118K, D183*, G184*, N195F, R320K and/or R458K. Choline oxidase. Preferably, the composition comprises a choline oxidase enzyme such as the 59.1 kDa choline oxidase enzyme endogenous to Arthrobacter nicotianae, produced using the techniques disclosed in D. Ribitsch e? al., Applied Microbiology and Biotechnology, Volume 81, Number 5, pp875-886, (2009). cutinases; phospholipases; and any mixture thereof. Identity. The relativity between two amino acid sequences is described by the parameter "identity". For purposes of the present invention, the alignment of two amino acid sequences is determined by using the Needle program from the EMBOSS package (http://emboss.org) version 2.8.0. The Needle program implements the global alignment algorithm described in Needleman, S. B. and Wunsch, C. D. (1970) J. Mol. Biol. 48, 443-453. The substitution matrix used is BLOSUM62, gap opening penalty is 10, and gap extension penalty is 0.5. Enzyme stabilizer. The composition may comprise an enzyme stabilizer. Suitable enzyme stabilizers include polyols such as propylene glycol or glycerol, sugar or sugar alcohol, lactic acid, reversible protease inhibitor, boric acid, or a boric acid derivative, e.g., an aromatic borate ester, or a phenyl boronic acid derivative such as 4-formylphenyl boronic acid. It may be preferred for the composition to comprise a nil-boron enzyme stabilizer, preferably selected from polyols such as propylene glycol or glycerol, sugar or sugar alcohol. It may even be preferred for the composition to be substantially free of boron. By substantially free it is typically meant: "comprises no deliberately added". Polymers. The composition preferably comprises polymer. Suitable polymers are selected from amphilic alkoxylated grease cleaning polymer and random graft co-polymers. Such polymers are described in more detail below. Suitable polymers include polyamines, preferably polyethylene imines, most preferably alkoxylated polyethylene imines. Other suitable polymers include dye transfer inhibitors, such as polyvinyl pyrrolidone polymer, polyamine N-oxide polymer, co-polymer of N-vinylpyrrolidone and N-vinylimidazole polymers. Non-polymeric dye transfer inhibitors may also be used, such as manganese phthalocyanine, peroxidases, and mixtures thereof. Amphiphilic alkoxylated grease cleaning polymer. Amphiphilic alkoxylated grease cleaning polymers of the present invention refer to any alkoxylated polymers having balanced hydrophilic and hydrophobic properties such that they remove grease particles from fabrics and surfaces. Specific embodiments of the amphiphilic alkoxylated grease cleaning polymers of the present invention comprise a core structure and a plurality of alkoxylate groups attached to that core structure. (I) (I I) (I I I) (IV) wherein # in each case denotes one -half of a bond between a nitrogen atom and the free binding position of a group A1 of two adjacent repeating units of formulae (I), (II), (III) or (IV); * in each case denotes one-half of a bond to one of the alkoxylate groups; and A1 is independently selected from linear or branched C2-C6-alkylene; wherein the polyalkylenimine structure consists of 1 repeating unit of formula (I), x repeating units of formula (II), y repeating units of formula (III) and y+l repeating units of formula (IV), wherein x and y in each case have a value in the range of from 0 to about 150; where the average weight average molecular weight, Mw, of the polyalkylenimine core structure is a value in the range of from about 60 to about 10,000 g/mol. wherein A are independently selected from Ci-C6-alkylene; R1, R1*, R2, R2*, R3, R3*, R4, R4*, R5 and R5* are independently selected from hydrogen, alkyl, cycloalkyl or aryl, wherein the last three mentioned radicals may be optionally substituted; and R6 is selected from hydrogen, alkyl, cycloalkyl or aryl, wherein the last three mentioned radicals may be optionally substituted. wherein * in each case denotes one-half of a bond to the nitrogen atom of the repeating unit of formula (I), (II) or (IV); A2 is in each case independently selected from 1,2-propylene, 1,2- butylene and 1 ,2-isobutylene; A3 is 1,2-propylene; R is in each case independently selected from hydrogen and Ci-C4-alkyl; m has an average value in the range of from 0 to about 2; n has an average value in the range of from about 20 to about 50; and p has an average value in the range of from about 10 to about 50. Specific embodiments of the amphiphilic alkoxylated grease cleaning polymers may be selected from alkoxylated polyalkylenimines having an inner polyethylene oxide block and an outer polypropylene oxide block, the degree of ethoxylation and the degree of propoxylation not going above or below specific limiting values. Specific embodiments of the alkoxylated polyalkylenimines according to the present invention have a minimum ratio of polyethylene blocks to polypropylene blocks (n/p) of about 0.6 and a maximum of about 1.5(x+2y+l) 1/2. Alkoxykated polyalkyenimines having an n/p ratio of from about 0.8 to about 1.2(x+2y+l)1 2 have been found to have especially beneficial properties. The alkoxylated polyalkylenimines according to the present invention have a backbone which consists of primary, secondary and tertiary amine nitrogen atoms which are attached to one another by alkylene radicals A and are randomly arranged. Primary amino moieties which start or terminate the main chain and the side chains of the polyalkylenimine backbone and whose remaining hydrogen atoms are subsequently replaced by alkylenoxy units are referred to as repeating units of formulae (I) or (IV), respectively. Secondary amino moieties whose remaining hydrogen atom is subsequently replaced by alkylenoxy units are referred to as repeating units of formula (II). Tertiary amino moieties which branch the main chain and the side chains are referred to as repeating units of formula (III). Since cyclization can occur in the formation of the polyalkylenimine backbone, it is also possible for cyclic amino moieties to be present to a small extent in the backbone. Such polyalkylenimines containing cyclic amino moieties are of course alkoxylated in the same way as those consisting of the noncyclic primary and secondary amino moieties. The polyalkylenimine backbone consisting of the nitrogen atoms and the groups A1, has an average molecular weight Mw of from about 60 to about 10,000 g/mole, preferably from about 100 to about 8,000 g/mole and more preferably from about 500 to about 6,000 g/mole. The sum (x+2y+l) corresponds to the total number of alkylenimine units present in one individual polyalkylenimine backbone and thus is directly related to the molecular weight of the polyalkylenimine backbone. The values given in the specification however relate to the number average of all polyalkylenimines present in the mixture. The sum (x+2y+2) corresponds to the total number amino groups present in one individual polyalkylenimine backbone. The radicals A1 connecting the amino nitrogen atoms may be identical or different, linear or branched C2-C6-alkylene radicals, such as 1 ,2-ethylene, 1,2-propylene, 1,2-butylene, 1,2- isobutylene,l,2-pentanediyl, 1,2-hexanediyl or hexamethylen. A preferred branched alkylene is 1,2-propylene. Preferred linear alkylene are ethylene and hexamethylene. A more preferred alkylene is 1,2-ethylene. The hydrogen atoms of the primary and secondary amino groups of the polyalkylenimine backbone are replaced by alkylenoxy units of the formula (V). A2 in each case is selected from 1,2-propylene, 1,2-butylene and 1,2-isobutylene; preferably A2 is 1,2-propylene. A3 is 1,2-propylene; R in each case is selected from hydrogen and Ci-C4-alkyl, such as methyl, ethyl, n-propyl, isopropyl, n-butyl, isobutyl and tert.-butyl; preferably R is hydrogen. The index m in each case has a value of 0 to about 2; preferably m is 0 or approximately 1; more preferably m is 0. The index n has an average value in the range of from about 20 to about 50, preferably in the range of from about 22 to about 40, and more preferably in the range of from about 24 to about 30. The index p has an average value in the range of from about 10 to about 50, preferably in the range of from about 11 to about 40, and more preferably in the range of from about 12 to about 30. Preferably the alkylenoxy unit of formula (V) is a non-random sequence of alkoxylate blocks. By non-random sequence it is meant that the [-A2-0-]m is added first (i.e., closest to the bond to the nitrgen atom of the repeating unit of formula (I), (II), or (III)), the [-CH2-CH2-0-]n is added second, and the [-A3-0-]p is added third. This orientation provides the alkoxylated polyalkylenimine with an inner polyethylene oxide block and an outer polypropylene oxide block. The substantial part of these alkylenoxy units of formula (V) is formed by the ethylenoxy units -[CH2-CH2-0)]n- and the propylenoxy units -[Ο¾-Ο¾(Ο¾)-0]ρ-. The alkylenoxy units may additionally also have a small proportion of propylenoxy or butylenoxy units -[A2-0]m-, i.e. 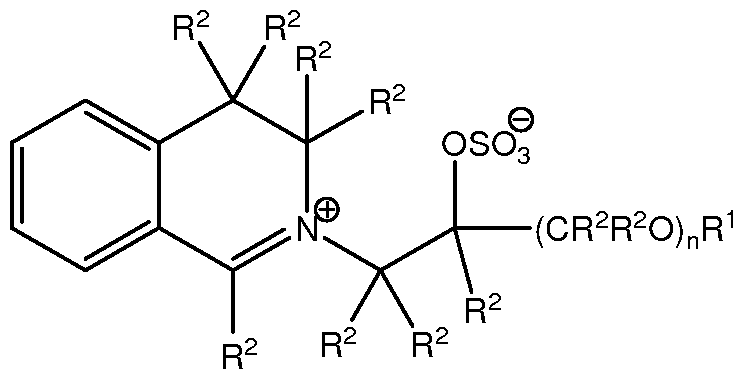 the polyalkylenimine backbone saturated with hydrogen atoms may be reacted initially with small amounts of up to about 2 mol, especially from about 0.5 to about 1.5 mol, in particular from about 0.8 to about 1.2 mol, of propylene oxide or butylene oxide per mole of NH- moieties present, i.e. incipiently alkoxylated. This initial modification of the polyalkylenimine backbone allows, if necessary, the viscosity of the reaction mixture in the alkoxylation to be lowered. However, the modification generally does not influence the performance properties of the alkoxylated polyalkylenimine and therefore does not constitute a preferred measure. The amphiphilic alkoxylated grease cleaning polymers are present in the detergent and cleaning compositions of the present invention at levels ranging from about 0.05% to 10% by weight of the composition. Embodiments of the compositions may comprise from about 0.1% to about 5% by weight. More specifically, the embodiments may comprise from about 0.25 to about 2.5% of the grease cleaning polymer. Random graft co-polymer. 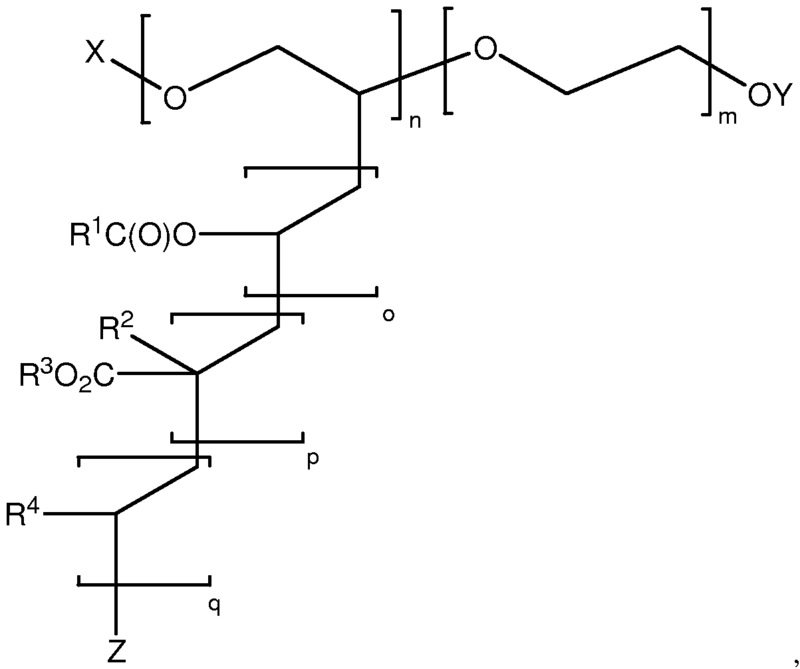 The random graft co-polymer comprises: (i) hydrophilic backbone comprising monomers selected from the group consisting of: unsaturated Ci_C6 carboxylic acids, ethers, alcohols, aldehydes, ketones, esters, sugar units, alkoxy units, maleic anhydride, saturated polyalcohols such as glycerol, and mixtures thereof; and (ii) hydrophobic side chain(s) selected from the group consisting of: C4-C25 alkyl group, polypropylene, polybutylene, vinyl ester of a saturated Ci-C6 mono-carboxylic acid, Ci_C 6 alkyl ester of acrylic or methacrylic acid, and mixtures thereof. wherein X, Y and Z are capping units independently selected from H or a Ci_6 alkyl; each R1 is independently selected from methyl and ethyl; each R2 is independently selected from H and methyl; each R3 is independently a C1-4 alkyl; and each R4 is independently selected from pyrrolidone and phenyl groups. The weight average molecular weight of the polyethylene oxide backbone is typically from about 1,000 g/mol to about 18,000 g/mol, or from about 3,000 g/mol to about 13,500 g/mol, or from about 4,000 g/mol to about 9,000 g/mol. The value of m, n, o, p and q is selected such that the pendant groups comprise, by weight of the polymer at least 50%, or from about 50% to about 98%, or from about 55% to about 95%, or from about 60% to about 90%. The polymer useful herein typically has a weight average molecular weight of from about 1,000 to about 100,000 g/mol, or preferably from about 2,500 g/mol to about 45,000 g/mol, or from about 7,500 g/mol to about 33,800 g/mol, or from about 10,000 g/mol to about 22,500 g/mol. Soil release polymers. Suitable soil release polymers include polymers comprising at least one monomer unit selected from saccharide, dicarboxylic acid, polyol and combinations thereof, in random or block configuration. Other suitable soil release polymers include ethylene terephthalate-based polymers and co-polymers thereof, preferably co-polymers of ethylene terephthalate and polyethylene oxide in random or block configuration. Anti-redeposition polymers. The composition may comprise anti-redeposition polymer, preferably from 0.1 wt% to 10wt% anti-redeposition polymer. Suitable anti-redeposition polymers include carboxylate polymers, such as polymers comprising at least one monomer selected from acrylic acid, maleic acid (or maleic anhydride), fumaric acid, itaconic acid, aconitic acid, mesaconic acid, citraconic acid, methylenemalonic acid, and any mixture thereof. Suitable carboxylate polymers include. Other suitable anti-redeposition polymers include polyethylene glycol, preferably having a molecular weight in the range of from 500 to 100,000 Da. Carboxylate polymers. It may be preferred for the composition to comprise from above 0wt% to 5wt%, by weight of the composition, of polymeric carboxylate. The polymeric carboxylate can sequester free calcium ions in the wash liquor. The carboxylate polymers can also act as soil dispersants and can provide an improved particulate stain removal cleaning benefit. The composition preferably comprises polymeric carboxylate. 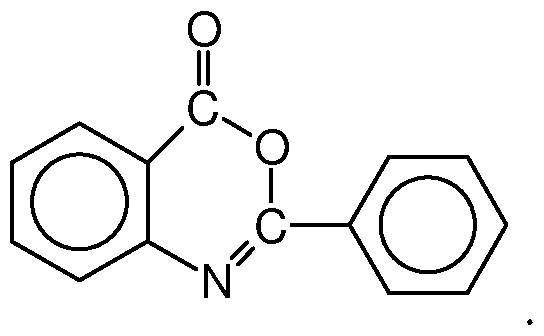 Preferred polymeric carboxylates include: polyacrylates, preferably having a weight average molecular weight of from l,000Da to 20,000Da; co-polymers of maleic acid and acrylic acid, preferably having a molar ratio of maleic acid monomers to acrylic acid monomers of from 1:1 to 1:10 and a weight average molecular weight of from 10,000Da to 200,000Da, or preferably having a molar ratio of maleic acid monomers to acrylic acid monomers of from 0.3:1 to 3:1 and a weight average molecular weight of from 1 ,000Da to 50,000Da. Deposition aids. The composition may comprise deposition aid. Suitable deposition aids are polysaccharides, preferably cellulosic polymers. Other suitable deposition aids include poly diallyl dimethyl ammonium halides (DADMAC), and co-polymers of DADMAC with vinyl pyrrolidone, acrylamides, imidazoles, imidazolinium halides, and mixtures thereof, in random or block configuration. Other suitable deposition aids include cationic guar gum, cationic cellulose such as cationic hydoxyethyl cellulose, cationic starch, cationic polyacylamides, and mixtures thereof. Hueing agent. The composition may comprise hueing dye. Hueing dyes are formulated to deposit onto fabrics from the wash liquor so as to improve fabric whiteness perception. 570nm to 630nm. This may be provided for example by mixing a red and green-blue dye to yield a blue or violet shade. Examples of suitable dyes are direct violet 7 , direct violet 9 , direct violet 11, direct violet 26, direct violet 31, direct violet 35, direct violet 40, direct violet 41, direct violet 51, direct violet 66, direct violet 99, acid violet 50, acid blue 9, acid violet 17, acid black 1 , acid red 17, acid blue 29, solvent violet 13, disperse violet 27 disperse violet 26, disperse violet 28, disperse violet 63 and disperse violet 77, basic blue 16, basic blue 65, basic blue 66, basic blue 67, basic blue 71, basic blue 159, basic violet 19, basic violet 35, basic violet 38, basic violet 48; basic blue 3 , basic blue 75, basic blue 95, basic blue 122, basic blue 124, basic blue 141, thiazolium dyes, reactive blue 19, reactive blue 163, reactive blue 182, reactive blue 96, Liquitint® Violet CT (Milliken, Spartanburg, USA) and Azo-CM-Cellulose (Megazyme, Bray, Republic of Ireland). Perfume microcapsule. The composition may comprise perfume in microcapsule form. Preferably, the composition comprises a perfume microcapsule. Preferred perfume microcapsules comprise melamine formaldehyde, urea formaldehyde, urea, or mixtures thereof. Solvent. The composition preferably comprises solvent. Preferred solvents include alcohols and/or glycols, preferably methanol, ethanol and/or propylene glycol. Preferably, the composition comprises no or minimal amounts of methanol and ethanol and instead comprises relatively high amounts of propylene glycol, for improved enzyme stability. Preferably, the composition comprises propylene glycol. Suitable solvents include C4-C14 ethers and diethers, glycols, alkoxylated glycols, C6-Ci6 glycol ethers, alkoxylated aromatic alcohols, aromatic alcohols, aliphatic branched alcohols, alkoxylated aliphatic branched alcohols, alkoxylated linear C1-C5 alcohols, linear C1-C5 alcohols, amines, C8-C14 alkyl and cycloalkyl hydrocarbons and halohydrocarbons, and mixtures thereof. Preferred solvents are selected from methoxy octadecanol, 2-(2-ethoxyethoxy)ethanol, benzyl alcohol, 2-ethylbutanol and/or 2- methylbutanol, 1-methylpropoxyethanol and/or 2- methylbutoxyethanol, linear C1-C5 alcohols such as methanol, ethanol, propanol, butyl diglycol ether (BDGE), butyltriglycol ether, tert-amyl alcohol, glycerol, isopropanol and mixtures thereof. Particularly preferred solvents which can be used herein are butoxy propoxy propanol, butyl diglycol ether, benzyl alcohol, butoxypropanol, propylene glycol, glycerol, ethanol, methanol, isopropanol and mixtures thereof. Other suitable solvents include propylene glycol and diethylene glycol and mixtures thereof. Free water. The composition preferably comprises less than 10wt%, or less than 5wt%, or less than 4wt% or less than 3wt% free water, or less than 2wt% free water, or less than lwt% free water, and may even be anhydrous, typically comprising no deliberately added free water. Free water is typically measured using Karl Fischer titration. 2g of the laundry detergent composition is extracted into 50ml dry methanol at room temperature for 20 minutes and analyse 1ml of the methanol by Karl Fischer titration. Other detergent ingredients. The composition typically comprises other detergent ingredients. Suitable detergent ingredients include: transition metal catalysts; enzymes such as amylases, carbohydrases, cellulases, laccases, lipases, bleaching enzymes such as oxidases and peroxidases, proteases, pectate lyases and mannanases; suds suppressing systems such as silicone based suds suppressors; brighteners; hueing agents; photobleach; fabric -softening agents such as clay, silicone and/or quaternary ammonium compounds; flocculants such as polyethylene oxide; dye transfer inhibitors such as polyvinylpyrrolidone, poly 4-vinylpyridine N-oxide and/or copolymer of vinylpyrrolidone and vinylimidazole; fabric integrity components such as oligomers produced by the condensation of imidazole and epichlorhydrin; soil dispersants and soil anti- redeposition aids such as alkoxylated polyamines and ethoxylated ethyleneimine polymers; anti- redeposition components such as polyesters; perfumes such as perfume microcapsules; soap rings; aesthetic particles; dyes; fillers such as sodium sulphate, although it is preferred for the composition to be substantially free of fillers; silicate salt such as sodium silicate, including 1.6R and 2.0R sodium silicate, or sodium metasilicate; co-polyesters of di-carboxylic acids and diols; cellulosic polymers such as methyl cellulose, carboxymethyl cellulose, hydroxyethoxycellulose, or other alkyl or alkylalkoxy cellulose; and any combination thereof. Laundry detergent product. The present invention also provides a laundry detergent product. The laundry detergent product is a non-unit dose laundry detergent product comprising the combination of: (i) a single-compartment container; and (ii) a laundry detergent composition. The laundry detergent composition is described in more detail above. The composition is pourable. The single-compartment container can be any suitable container, such a bottle or a squeezable bottle, typically dispensing the laundry detergent composition from either top, bottom and/or side by appropriately placed opening and dispensing means. Method of laundering fabric. The method of laundering fabric comprises the step of contacting the laundry detergent composition to water to form a wash liquor, and laundering fabric in said wash liquor. The laundry detergent composition is described in more detail above. The fabric may be contacted to the water prior to, or after, or simultaneous with, contacting the laundry detergent composition with water. Typically, the wash liquor is formed by contacting the laundry detergent to water in such an amount so that the concentration of laundry detergent composition in the wash liquor is from above Og/1 to 4g/l, preferably from lg/1, and preferably to 3.5g/l, or to 3.0g/l, or to 2.5g/l, or to 2.0g/l, or to 1.5g/l, or even to l.Og/1, or even to 0.5g/l. Highly preferably, the method of laundering fabric is carried out in a front-loading automatic washing machine. In this embodiment, the wash liquor formed and concentration of laundry detergent composition in the wash liquor is that of the main wash cycle. Any input of water during any optional rinsing step(s) that typically occurs when laundering fabric using a front-loading automatic washing machine is not included when determining the volume of the wash liquor. Of course, any suitable automatic washing machine may be used, although it is extremely highly preferred that a front-loading automatic washing machine is used. The weight average particle size of the suspended solid bleach particles is at least 25 micrometers, and 100wt% of the suspended solid bleach particle sizes have a size in the range of from 0.1 micrometers to 500 micrometers. The density of the suspended solid bleach particles is less than 500g/l, and the dynamic viscosity of the continuous liquid phase is in the range of 300mPas. wherein the composition comprises at least lwt% solid particles suspended within a continuous liquid phase, wherein the suspended solid particles comprise bleach, wherein the weight average particle size of the suspended solid bleach particles is at least 1 micrometer, wherein at least 95wt% of the suspended solid bleach particle sizes have a size in the range of from 0.1 micrometers to 500 micrometers, wherein the density of the suspended solid bleach particles is less than 500g/l, and wherein the dynamic viscosity of the continuous liquid phase is in the range of from lOOmPas to 500mPas. 2. A composition according to claim 1, wherein the composition comprises at least 10wt% solid particles suspended within a continuous liquid phase, wherein the suspended solid particles comprise bleach, and wherein the weight average particle size of the suspended solid bleach particles is in the range of from 1 micrometer to 50 micrometers, and wherein at least 99wt% of the suspended solid bleach particle sizes have a size in the range of from 1 micrometers to 50 micrometers, and wherein the density of the suspended solid bleach particles is less than 500g/l and wherein the dynamic viscosity of the continuous liquid phase is at least lOmPas. 3. A composition according to claim 1, wherein the ratio of: (i) the density of the suspended solid bleach particles to (ii) the density of the continuous liquid phase is in the range of from 0.8: 1 to 1.2:1. 4. A composition according to claim 1 , wherein the suspended solid bleach particles comprise pre-formed peracid. 5. A composition according to claim 1, wherein the suspended solid particles comprise phthalimido peroxy caproic acid. 6. A composition according to claim 1 , wherein the composition comprises a bleach catalyst. 7. A composition according to claim 1, wherein the suspended solid bleach particles comprise an oxaziridinium-based bleach catalyst. (ii) separate particles comprising bleach catalyst. 9. A composition according to claim 1 , wherein the suspended solid bleach particles comprise a transition metal bleach catalyst. 10. A composition according to claim 1, wherein the suspended solid bleach particles comprise bleaching enzyme. 11. A composition according to claim 1, wherein the suspended solid bleach particles comprise bleach activator and a source of hydrogen peroxide. 12. A composition according to claim 1, wherein the continuous liquid phase comprises detersive surfactant, optionally polymer and optionally enzyme. 13. A composition according to claim 1, wherein the detersive surfactant comprises anionic detersive surfactant and non-ionic detersive surfactant, and wherein the weight ratio of anionic detersive surfactant to non-ionic detersive surfactant is greater than 1:1.
alkanolammonium neutralised anionic detersive surfactant. 15. A composition according to claim 1, wherein the composition comprises perfume in microcapsule form. 16. A composition according to claim 1, wherein the composition comprises hueing agent. 17. A composition according to claim 1, wherein the composition comprises a variant of Thermomyces lanuginosa lipase having >90% identity with the wild type amino acid and comprising substitution(s) at T231 and/or N233, preferably T231R and/or N233R. 18. A composition according to claim 1, wherein the composition comprises polyamine. 19. A composition according to claim 1, wherein the continuous liquid phase is in the form of a gel. FR2562557A1 (en) * 1984-04-09 1985-10-11 Colgate Palmolive Co Anhydrous fluid coarse detergent compsn.